We got the chance to assemble our new Ikea Hemnes dresser over the weekend and I can't say enough great things about it! First, it is MUCH wider than I anticipated, which works out great for the corner is sits in. It's very sturdy and substantial. Ryan would have preferred a method that allows it to be screwed together and/or glued for reinforcement, but I think that's what you tend to get with Ikea. I say, for the price, you just can't beat it. Here's the precious dresser...also Ikea and something Ryan has had since college....it's lasted a great deal longer than we expected! As you can see...the back paneling was coming apart...definitely time for a change. Love that the drawers are lined with these cheery yellow stripes! What do you think about Ikea furniture? Any good finds I should know about?? I love Ikea and the drawer liners are so cute! What a big change in the room! It looks so much more updated and fresh. Love that dresser! I wish I could shop more at Ikea but to get at the nearest store, there is a 10 hour drive to do! It looks great! I got that same exact dresser a few years ago (in blue) & I am still in love with it! Oh WOW!! What an improvement!! Those drawer liners are precious too!! I love finding amazing items at Ikea! This fits that little nook perfectly! So much better! I have been eyeing that so good to know. I love the sie. Looks awesome! The drawer liners are a fantastic touch. Love the new look! The white definitely gives a new feel to that space and it fits perfectly! I Heart Ikea too! Too much I think, for my wallet :). MUCH better! I love IKEA. Seriously, and their furniture doesn't fall apart as easily as buying put together furniture at target does. Love it! I have a long, shorter one from there and love it! Looks fabulous! You're right, the size is just perfect. Job well done, Ikea. What a difference! I love the new dresser! SUCH a difference!! My sister has it in red, and it's lasted 3 years and counting! great find. Love it! It always amazes me how ONE piece of furniture can completely change a room!! It looks so great! I think for many items, IKEA is always a great option. Have you ever checked out the blog IKEA Hackers? People are so creative! Ahhhh the joys of throwing out our college furniture and getting "grown up" furniture (even if it comes from IKEA!) We have an IKEA literally 5 minutes from our house and we go there WAY too often!!!! looks so good! i was just admiring this piece online the other day. fits your room perfectly! Perfect fit! Meant to be! Got to love Ikea! The new dresser looks beautiful - definitely much classier! Love the before and after pics. The new dresser looks so good! It looks so good!! It is crazy how one piece of furniture can make such a difference! Looks great! That's a fantastic Ikea find. Okay, girl...HUGE difference! The big white dresser is perfect for the spot! Mega difference...it's so modern and elegant! That lining is adorable! I love some of the new pieces at Ikea, they really look so nice. Looks great in white here too. i like it a lot my dear!!! looks way better. white is growing on me so much lately and i never really enjoyed it before. LOVE it now. This post is hitting home for me. I rarely put home furnishings as a priority to the items in my closet, but now I find myself in a chicken/egg situation where I want more clothes, but need more space. I'll be going to IKEA soon to follow in your footsteps. I can feel it. Huge change! It looks great! 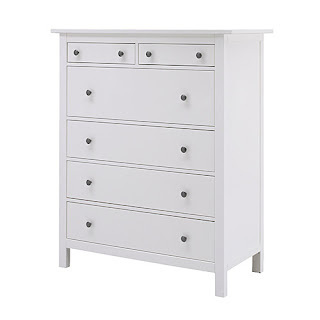 I haven't ever ordered anything from IKEA, but this dresser is great. I really love that dresser and the price is perfect! Thank goodness for Ikea!! Love the upgrade. I love the dresser! Actually, I think the one I want is exactly the same one but in red. I have one other Ikea item that I really love. Ikea...who knew! Looks great! i heart their hemnes collection! Such a great dresser! We got the long wide one for our nursery and it's awesome. I love the cheery drawer liners too! I had no idea ikea lined their drawers like that! how adorable! Love the new dresser, and white makes any space look bigger and cleaner! that did make a huge difference!!! we buy a lot of our kids furniture and accessories from ikea- the prices are phenomenal for such cool and simplistic stuff. what a difference! love it!! and i'm loving the lined drawers! great idea!! you fancy, dresser! looks good natasha! very cute! My sister has the 3 drawer version in her guest room. I was really surprised at how nice it was for an IKEA piece. It's a great buy for sure! It looks awesome. I heart Ikea too! That white dresser makes such a difference. Looks great.